EDISON – When Christine Zuttah's son Jeffrey said he wanted to play football at J.P. Stevens High School, she thought it was temporary. At the time, she couldn't imagine that he would be a trend-setter for his two younger brothers, A.J. and Jeremy. The Zuttahs moved from Ghana, where soccer is the dominant sport, to Edison, where Christine knew very little about football. "I didn't watch football until they (her sons) started playing," said Christine Zuttah, a pediatric nurse at Raritan Bay Medical Center in Perth Amboy. "It was dangerous. They (her sons) started out playing baseball." On Saturday, Christine Zuttah will be at Gillette Stadium in Foxborough, Massachusetts. with a small group of friends and family to watch Jeremy and his Baltimore Ravens teammates face the New England Patriots in the Division Playoffs. 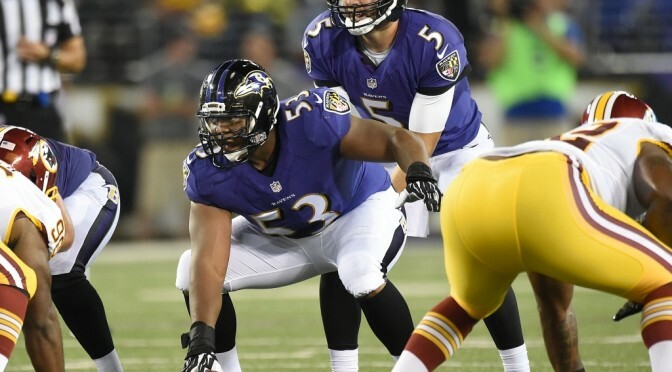 Jeremy Zuttah, 28, is the Ravens starting center after getting drafted by the Tampa Bay Buccaneers out of Rutgers in 2008. Baltimore acquired him in the spring of 2014 from Tampa Bay for a 2015 draft pick. On Thursday Edison Mayor Thomas Lankey honored Zuttah with a proclamation at the Edison Municipal Complex. Christine Zuttah accepted it on her son's behalf. Lankey asked the residents to wear purple on Friday — the primary color of the Ravens. Zuttah played in 44 games, including 40 starts, in four seasons with the Scarlet Knights from 2004-07. He was a two-time, first-team All-Big East selection in 2006 and 2007. He started in 28 straight games to finish his collegiate career, while not allowing a sack during that span. Zuttah graduated with an economics degree in 31/2 years. Christine Zuttah only missed one of her son's games while at Rutgers, a pretty good achievement considering she doesn't fly. "I was so happy this season when Jeremy was traded to Baltimore," she admitted. "I could take the train there." The mother of five sons, Zuttah has become a football mom. Her youngest son A.J. is playing at Dartmouth and Jeffrey played at Michigan and Stanford before contracting sickle cell anemia. Jeffrey Zuttah is at the Harvard Business School, Ernest Zuttah is a student in the civil engineering program at NJIT and Andy Zuttah is a financial analyst at a bank in Florida. "Jeremy is such a humble guy," said his mom. "He said, 'We should really give the accolades to Jeffrey. He (Jeremy) always told me (about playing in the NFL) it's no big deal." Christine Zuttah started out as the quiet NFL mom watching her son from the stands. On Saturday, she will be cheering him on with a homemade noise maker. "I know enough to enjoy the game," she said, "but I get so tense I don't know if I still enjoy it."